First, if you haven’t come across Kanban before, it’s a simple and elegant way of tracking processes such production (which is what it was originally designed for by a Toyota engineer back in the 1940’s), software development, and defect remediation by the use of “cards”. These cards (or tasks) typically list the details of an element in a process. If we’re talking about software development a task might be “Develop User Registration subsystem version 0.1” along with an estimation of time required and who the work is to be assigned to. 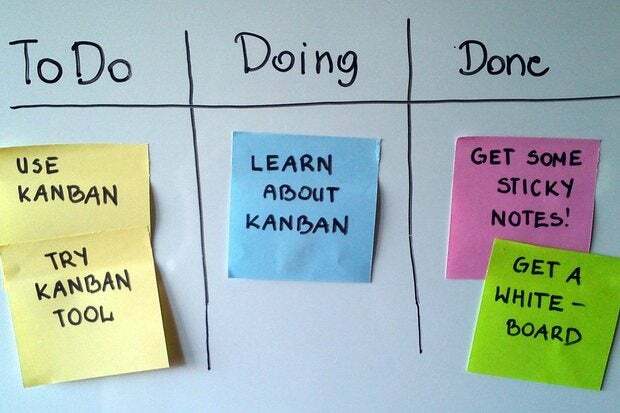 A Kanban board is divided vertically into columns and for software development these are often named Backlog, Ready, Work in progress, and Done. A task would usually enter the board in either Backlog or Ready and be moved from left to right until completed. If this sounds simplistic, it is … Kanban's strength and value is in providing a visual reference for what’s to be done, what’s being done, and what’s been completed and when you’re coordinating even a small team doing even the simplest projects, Kanban is a great way to keep everyone on track and to not overlook anything. So, Kanboard, This is a free, open source Kanban system that's outstanding in both it’s simplicity when setting up and in use and in its depth of features. Kanboard requires PHP 5.3.7 or above on Apache or Nginx along with the PHP extensions mbstring, gd, and pdo_sqlite (Kanboard uses Sqlite by default but both Mysql or Postgresql can be used). 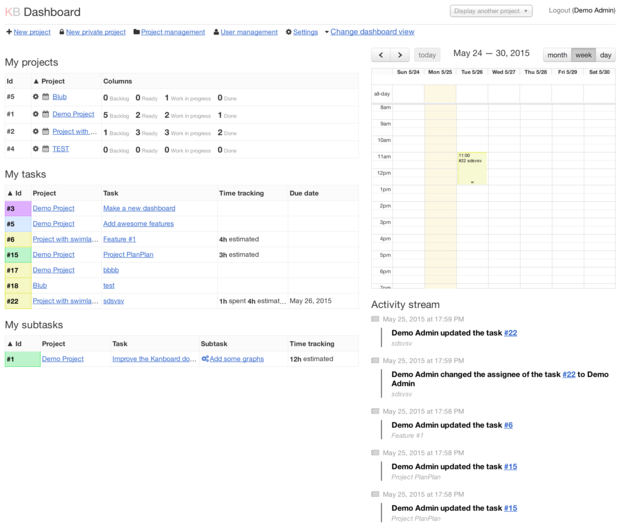 The default view for a logged-in user shows all of the projects they're part of as well as their tasks and subtasks. There's also a calendar that shows all tasks that are "Work in Progress" and an Activity Stream that documents all changes to the system. Kanboard has a simple user management system that allows for only two types of user; regular users and administrators. You can assign users' timezones and languages (currently localization for 18 languages is included) as well as assigning a default project. The Kanboard interface allows you to move tasks between columns by drag-and drop and you can define column titles and categories for tasks on a per project basis and, if required, restrict users to having only one subtask in progress. You can also enable time tracking for subtasks. 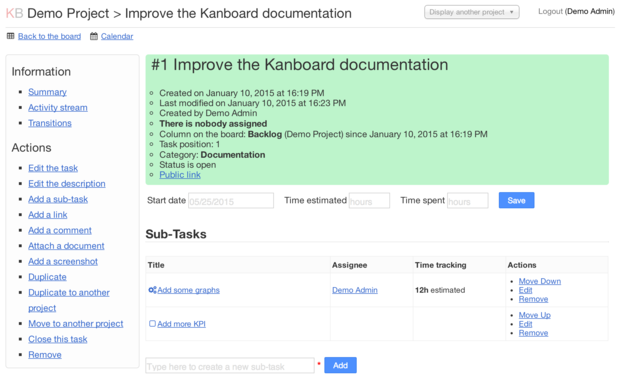 You can add sub-tasks, comments, documents, and screenshots to Kanboard tasks as well as duplicate the task to another project, create subtasks, close tasks and sub-tasks, and remove tasks from projects. Every action that affects a task or sub-task is tracked and logged providing an audit trail of exactly how the system is used. Kanboard also supports “swimlanes”, horizontal rows that divide the board into whatever categories you like such as departments, functions or individuals. You can share a project board with outside people (non-users) and there’s even automation that allows you to set up automatic changes to the task assignee, colors, or categories of tasks and sub-tasks based on events. Add to that analytics and integration with Github, Bitbucket, Gitlab, Hipchat, and Slack as well as email notification, multiple authentication systems (LDAP/ActiveDirectory, Google, Github and Reverse-Proxy) and a Json-RPC API and Webhooks to create tasks from an external software along with a command line interface and you have an amazing Kanban system that is efficient, elegant, and simple to deploy. If you haven’t explored Kanban as a project or process management strategy, this may be the lowest cost, lowest drag, and most elegant way for you to test it out.